Sir De Villiers Graaff in military uniform during World War II. 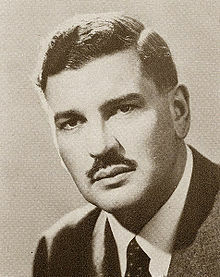 Sir De Villiers Graaff, 2nd Baronet (8 December 1913 – 4 October 1999) (first name De Villiers, surname Graaff) known as Div Graaff, was a South African politician who succeeded his father, Sir David Pieter de Villiers Graaff, 1st Baronet, to his baronetcy in 1931. He died in 1999 and was succeeded by his son, Sir David de Villiers Graaff, 3rd Baronet. He was the leader of the centrist United Party which was the official opposition in the then all-white South African Parliament from 1956 to 1977. Graaff succeeded his father as baronet in 1931. This baronetcy is one of twelve conferred on South Africans between 1841 and 1924. Graaff studied law at the University of Cape Town and Oxford. He was decorated for his military service in World War II. In 1932 he was noted for playing two first-class cricket matches for Western Province. His youngest brother was Johannes de Villiers Graaff, a noted South African Welfare Economist. Graaff became a member of the House of Assembly, the lower house of Parliament, in 1948, the year his United Party was ousted from government by the conservative National Party, which promised to enact a de jure system of apartheid. Victory in De Villiers' constituency (Hottentots-Holland) was the only UP pickup in the election; nevertheless, Graaff took over leadership of the United Party in 1956 from J.G.N. Strauss. He led the opposition to the governments of three apartheid prime ministers, Johannes Strijdom, Hendrik Verwoerd, and B.J. Vorster. He led the opposition to a republic in the 1960 referendum, and stated that South Africa's membership of the Commonwealth was under threat, and the declaration of a republic would lead to South Africa being isolated internationally. In 1977, the United Party was dissolved and the New Republic Party was founded, of which Graaff briefly served as interim leader before retiring. During his time as leader of the United Party it had split four times and been defeated in five general elections. The M1 highway, which was originally part of a ring road around the southern end of the Central Business District of Johannesburg to the affluent northern suburbs, was named the De Villiers Graaff Motorway in his honour. ^ Uys, Stanley (11 October 1999). "Sir de Villiers Graaff". The Guardian. London. Retrieved 1 May 2010. ^ a b c Pace, Eric (8 October 1999). "Sir de Villiers Graaff, 85, Leader Of South African Centrist Party". New York Times. Retrieved 11 January 2015. Div Looks Back: The memoirs of Sir De Villiers Graaff. Human & Rousseau, Cape Town. 1993. ISBN 0-7981-3176-4.